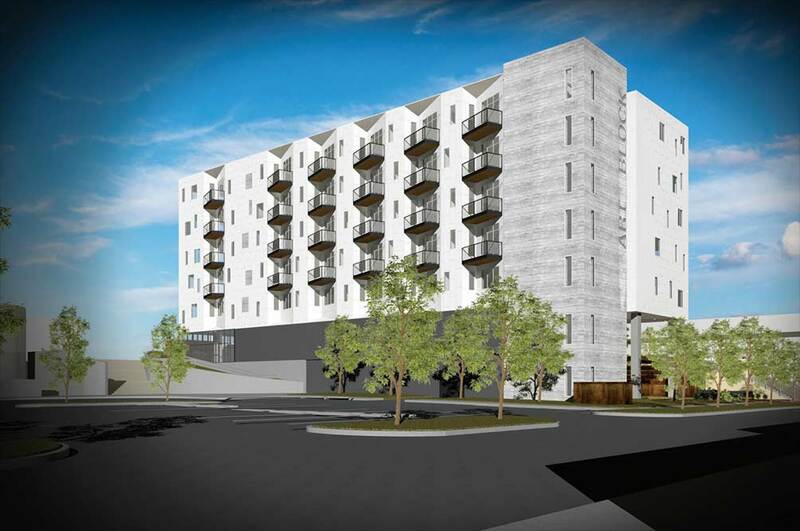 The Art Block Project is a proposed 70-unit mixed residential and commercial development that will be located in the up and coming Arts District in Waterloo, Iowa. The site is located on the river front overlooking an amphitheater, providing amazing views of the river and surrounding Arts District. 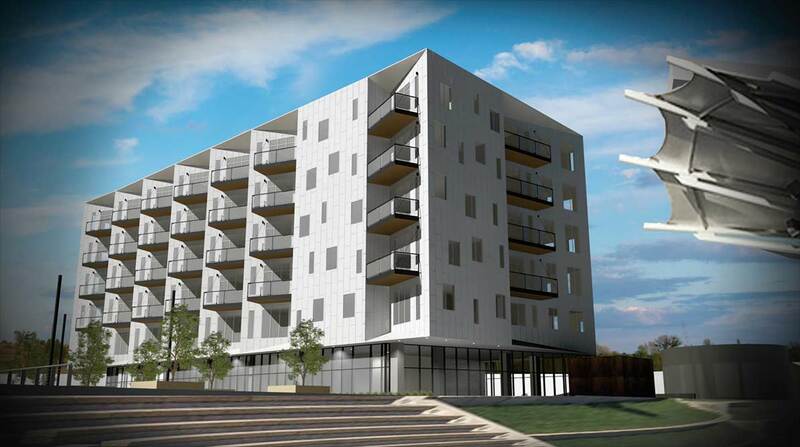 The 85’ “Art Block” building will add to the skyline and visual interest of downtown Waterloo. 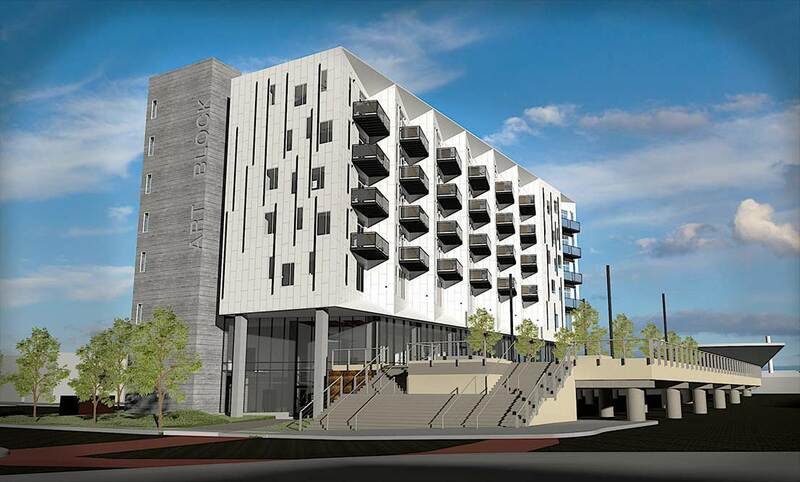 Becoming a visible landmark for the arts district. Even from across the river the design concept can be clearly recognized. Each unit is oriented to maximize the link to the exterior view. As such, the unit has a dividing wall that guides the occupant from the entryway towards the balcony. The diagonal wall also serves two additional purposes, the first is to divide the private space from the more public areas of the unit. While the second is to create a “gallery” wall that allows the tenants to display their art in a more intentional way. By placing the mechanical units near the shared hallway, each one can be serviced without disturbing the tenants within. view of the occupant towards the exterior balcony. Similar to the one bedroom scheme, the studio is divided into private and public areas, allowing the tenant to maintain privacy with guests present. 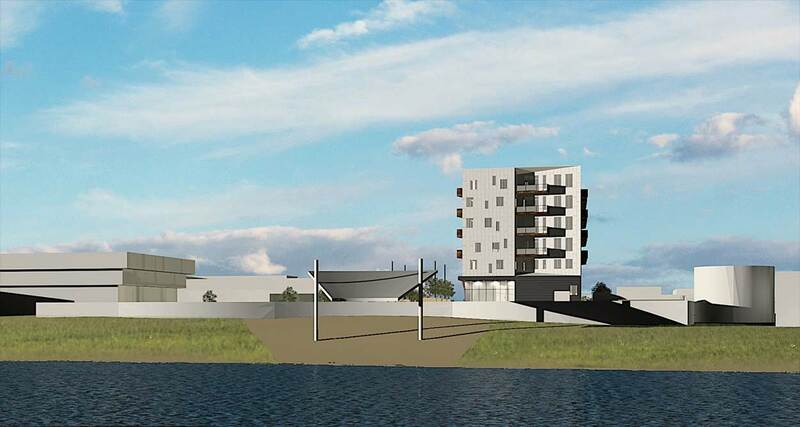 The site offers positive current views and potential future development views for the residential units. Within the residential massing, the challenge is longer facades are orientated perpendicular to the ideal site lines. To provide “river front” views to the residential units, the mass will need to be sculpted in alignment to maximize pleasing views. 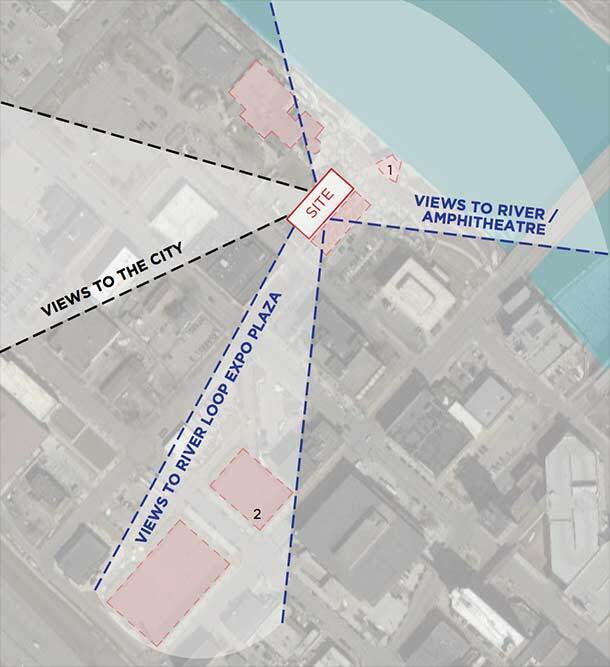 The existing site has limited “street frontage” and street connectivity to the river due to height of the existing raise plaza. 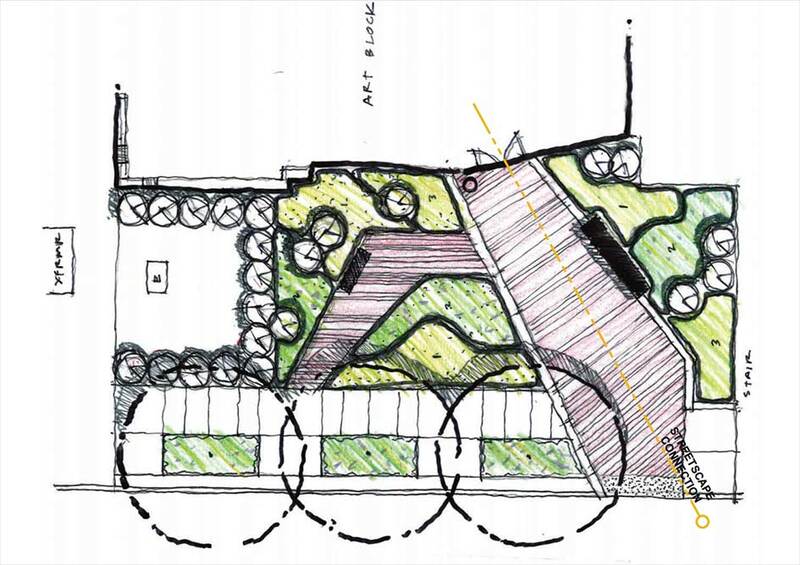 To create an active “first floor”, it is critical to create a form that links street plane and connects up to the plaza out to the amphitheater. 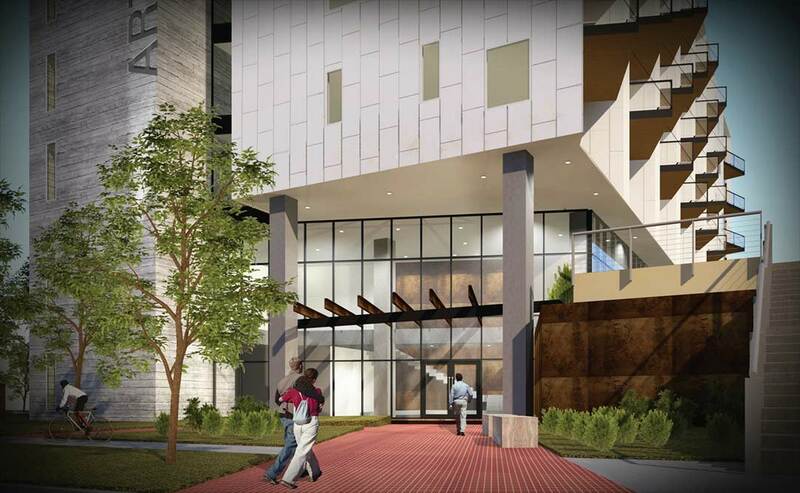 Above the retail/commercial plaza level, to maximize views onto both the river and the plaza-scape, the massing must respond to available view sheds onto the site. 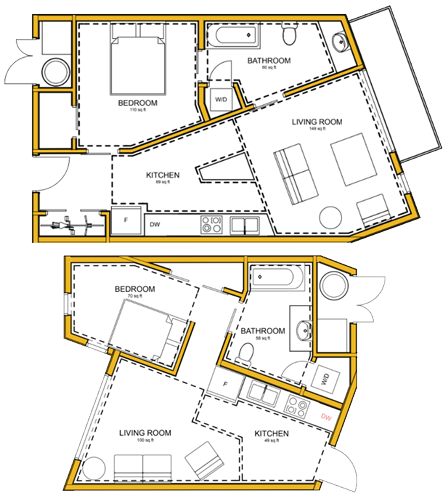 The carve paired with nestled into the form offers maximum “river front” units.